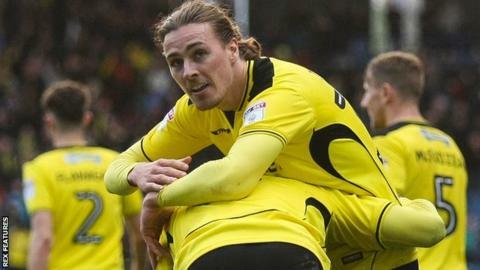 Substitute Jackson Irvine scored an injury-time goal as Burton boosted their hopes of avoiding relegation with victory at third-placed Huddersfield. David Wagner's Terriers dominated possession, but were unable to break down a determined Burton defence. Marvin Sordell forced a good save from home keeper Danny Ward after the break. And Town defender Dean Whitehead was sent off for a second yellow card before Australia international Irvine converted Sordell's cross to win it. The defeat means Huddersfield are now nine points adrift of Brighton in second, after the south-coast club defeated Blackburn, while Burton moved up to 19th, four points clear of the relegation places. Wagner made five changes after a 4-0 defeat by Bristol City and the home side had 73% of possession in the opening 45 minutes, but although Burton goalkeeper Jon McLaughlin had to push away an angled shot by Jack Payne, they carved out few clear-cut chances. Ward had to be alert at the other end to deny Sordell after the forward cut inside, prompting Huddersfield to send on Nahki Wells and Elias Kachunga to boost their attack. It was Michael Hefele, however, who came closest to a goal when his header was cleared off the line before Whitehead was dismissed after a clash with Tom Flanagan. Irvine then compounded their frustration as he followed his first goal for Australia against the United Arab Emirates in midweek with a crucial winner for Burton. Huddersfield manager David Wagner: "It's disappointing, not just because of the result but because of our performance, especially with the ball and in the final third. "We showed a lack of quality and we have made too many wrong decisions. "Against a difficult opponent an early goal would have helped. In the end wegave them a few counter-attacks and they have scored. The players tried everything." Burton manager Nigel Clough: "There's a lot of euphoria in the dressing room. I don't think anyone gave us a chance. "It's a big win but by no means a defining win which means we will stay up. "It's a great start to the week when we said anything we got from these next three games would be a bonus." Match ends, Huddersfield Town 0, Burton Albion 1. Second Half ends, Huddersfield Town 0, Burton Albion 1. Goal! Huddersfield Town 0, Burton Albion 1. Jackson Irvine (Burton Albion) right footed shot from the centre of the box to the centre of the goal. Assisted by Marvin Sordell following a fast break. John Mousinho (Burton Albion) is shown the yellow card for a bad foul. Attempt missed. Luke Murphy (Burton Albion) left footed shot from outside the box is too high. Assisted by Lucas Akins following a corner. Corner, Burton Albion. Conceded by Christopher Schindler. Attempt blocked. Marvin Sordell (Burton Albion) left footed shot from the centre of the box is blocked. Assisted by Luke Varney. Chris Löwe (Huddersfield Town) is shown the yellow card. Tom Flanagan (Burton Albion) is shown the yellow card. Second yellow card to Dean Whitehead (Huddersfield Town). Foul by Michael Hefele (Huddersfield Town). Attempt blocked. Michael Hefele (Huddersfield Town) header from the centre of the box is blocked. Assisted by Rajiv van La Parra with a cross. Attempt blocked. Elias Kachunga (Huddersfield Town) right footed shot from a difficult angle on the left is blocked. Assisted by Chris Löwe with a cross. Corner, Huddersfield Town. Conceded by Kyle McFadzean. Corner, Huddersfield Town. Conceded by Jon McLaughlin. Attempt blocked. Elias Kachunga (Huddersfield Town) header from the centre of the box is blocked. Attempt blocked. Rajiv van La Parra (Huddersfield Town) right footed shot from outside the box is blocked. Assisted by Chris Löwe. Attempt saved. Rajiv van La Parra (Huddersfield Town) right footed shot from the left side of the box is saved in the centre of the goal. Assisted by Chris Löwe. Ben Turner (Burton Albion) is shown the yellow card for a bad foul. Attempt missed. Ben Turner (Burton Albion) left footed shot from the left side of the box misses to the right following a corner. Attempt saved. Tom Flanagan (Burton Albion) left footed shot from the centre of the box is saved in the centre of the goal. Substitution, Huddersfield Town. Philip Billing replaces Collin Quaner. Marvin Sordell (Burton Albion) is shown the yellow card for a bad foul. Substitution, Burton Albion. Lucas Akins replaces Lasse Vigen Christensen.